The global enterprise social software market is foretold to grow at a faster pace in the present enterprise ecosystem. The demand for enterprise social software systems and solutions could increase in the near future because of their user-friendly and flexible nature focused on improving the business value of organizations across the globe. Besides sheer social networking and connectivity, these solutions offer various benefits to users. Early adopters of enterprise social software are evangelizing the different advantages of this social suite even now. Prominent pervasiveness and global adoption trends across most verticals are clear signs of the optimistic growth of the market. The global enterprise social software market is foreseen to expand at a CAGR of 20.0% during the forecast period 2017–2022. By 2022, the market could be valued at a US$6.1 bn from a US$2.4 bn achieved in 2017. The world enterprise social software market is prognosticated to be cataloged into three segments, viz. large, medium, and small, on the basis of enterprise size. Out of these markets, large enterprise could generate an overpowering revenue of US$4.0 bn by the end of 2022. The absolute growth produced by this segment could be larger than any other under the same classification. However, there could be a slight drop in the market share of large enterprise, from a 69.0% in 2017 to a 66.1% in 2022. In terms of segmentation by vertical, the world enterprise social software market is envisaged to be segregated into banking, financial services, and insurance (BFSI), healthcare, IT and telecommunications, retail, and government. As per deployment, on-premise and cloud-based could be the key markets for enterprise social software. The analysts provide a deep insight into all of these segments so that readers could gain a sound understanding of their future projections and performance in the world enterprise social software market. As far as the geographical study of the international enterprise social software market is concerned, prime regions such as North America, Latin America, Europe, Asia Pacific except Japan (APEJ), and the Middle East and Africa (MEA) and Japan could take a significant position. Nevertheless, North America is envisioned to be an extremely promising market for enterprise social software with a 21.5% CAGR expected to be posted between 2017 and 2022. Throughout the course of the forecast timeframe, the region could dominate the market in view of revenue. Japan and the MEA are anticipated to lose massive basis points (BPS) in their market share by 2022 over 2017, i.e. 170 and 92 respectively. Europe could be a lucrative region for the international enterprise social software market as it is projected to reach a valuation of US$1.3 bn by 2022 end. APEJ, on other hand, could reach a US$1.0 bn by the same year. Some of the crucial industry players in the worldwide enterprise social software market are predicted to be Aurea, Inc., IBM Corporation, Lithium Technologies, Inc., Microsoft Corporation, Salesforce.com, Inc., SAP, Socialtext, Inc., Synacor, Inc., TIBCO Software, Inc., and VMWare, Inc. The global enterprise social software market is envisaged to gain traction on the back of the growing adoption of social media. The penetration of sites related to social media is at its peak. Employees are asking for a similar experience at their work sites. The market could be propelled further with the surging count of positive case studies of organizations producing an encouraging return on investment (ROI). This could also be helped by the mounting count of use cases of social software. The market is envisioned to experience a positive effect due to the confluence of collaboration software and social software into one solution offering. The publication covers the current scenario and future growth opportunities of the global enterprise social software market for the forecast period 2017–2022. Moreover, factors such as market trends, growth drivers and restraints, and vendor competition are comprehensively explained by the analysts. At a staggering rate, the need for niche software could be said to have aggravated significantly in the recent time. This is prophesied to be on account of an increase in the requirement of enterprise social technology. As a result, the world enterprise social software market could receive a solid push in its growth in the coming years. A number of software developers are becoming part of the software bandwagon to provide or develop enterprise social software across the world. The influx of software developers in the industry could be attributed to the rise of enterprise social software gaining impetus around the world, including emerging regions such as Africa and Asia Pacific. 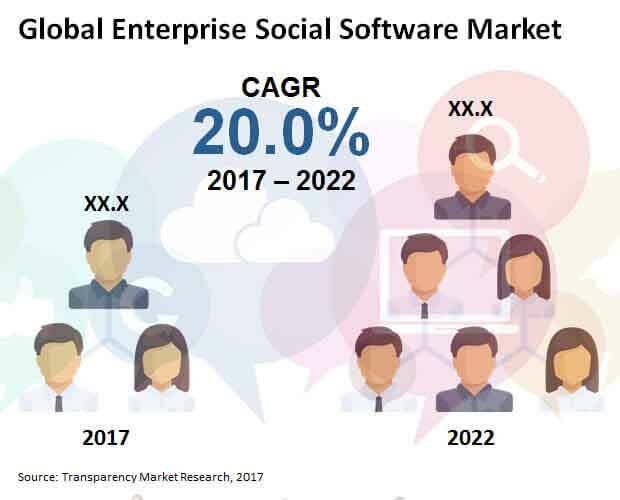 The international enterprise social software market is anticipated to witness the presence of segments such as small, medium, and large by enterprise size. As per the analysis of the researchers, large enterprise could be a stronger market representing an estimated US$1.7 bn of revenue size in 2017. Between 2017 and 2022, this market is prognosticated to grow at an annual revenue of approximately US$0.4 bn. As per vertical, the international enterprise social software market could be classified into banking, financial services, and insurance (BFSI), healthcare, IT and telecommunications, retail, and government. By type of deployment, the international enterprise social software market is predicted to be segmented into on-premise and cloud-based. Regionally, the international enterprise social software market could be segregated into North America, Latin America, Europe, Asia Pacific except Japan (APEJ), and the Middle East and Africa (MEA) and Japan. Amongst these regions, the report states that North America could lead the market with a roughly US$0.9 bn expected to be secured under its belt in 2017. The analysts profile some of the dominating companies in the worldwide enterprise social software market such as Aurea, Inc., IBM Corporation, Lithium Technologies, Inc., Microsoft Corporation, Salesforce.com, Inc., SAP, Socialtext, Inc., Synacor, Inc., TIBCO Software, Inc., and VMWare, Inc. Besides a complete company profile, the report provides an important analysis of the market shares of key players.